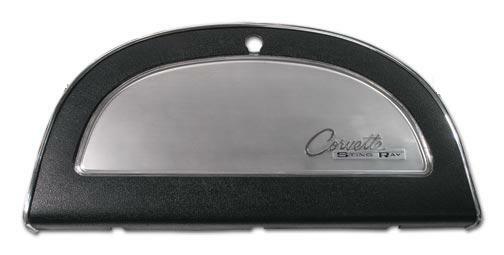 Mid year glove box doors for every mid-year Corvette. The 1963 assembly is a completely different design from the 64-65 and the 66-67. A metal insert embossed with Corvette sting ray is used in the 63 style while the other two styles are painted silver and an emblem is attached for the correct year. A hinge back plate is included for the 63 style. All have the original correct spun-over rivets on the inside. Guaranteed to not loose NCRS points!